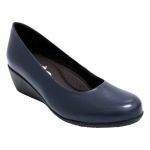 Sofia by Zeta is a formal closed-toe wedge pump. You would wear Sofia to work or even to a special event. Sofia has soft supple leather and a comfortable fit. Sofia comes with arch support and a padded footbed for long-lasting comfort. 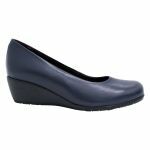 Sofia has a treaded sole for grip and the classic round toe shape. Sofia is the perfect minimalistic business heel, not only does Sofia look smart it looks fashionable too.